Last night was a little crazy, and fitting dinner in to an already full night didn’t help matters. But I did, with much help from my hunny. A few weeks ago, I had a bought a chicken and apple sausage from Sam’s Club that looked absolutely scrumptious and I needed a way to use it. 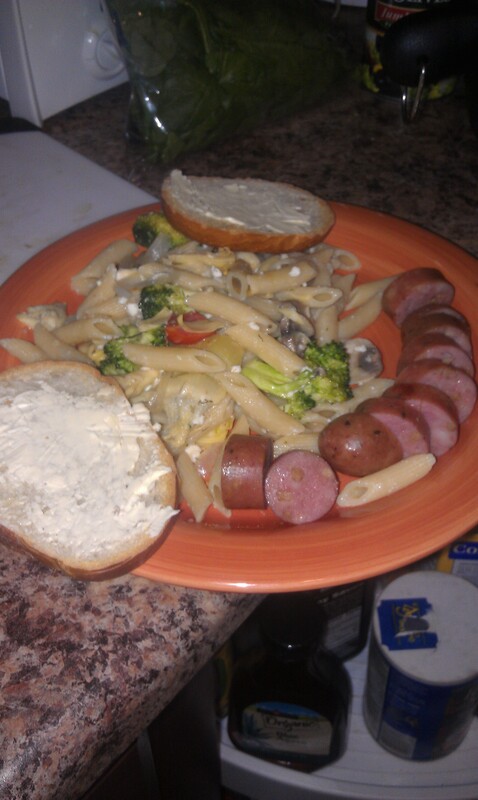 There was a picture… somewhere… that I saw that had sausage mixed with pasta with broccoli. Inspiration turned on the little lightbulb above my head. Pasta – I used penne rigate because of the ridges, I needed it to hold as much flavor as possible. 1/4 White Onion, sliced in to ribbons. Would also be good with red onion. Preheat your oven to 375 degrees. Put your sausage on a sheet tray and cover loosely with foil. Once the oven is preheated, put the sausage in and cook for 10 minutes – the sausage is already fully cooked, you’re just warming it up. Get your water boiling for the pasta, and when it’s a rolling boil, add sea salt and olive oil. You can’t really skip this step because this pasta doesn’t have a sauce, and this will add flavor to the noodles themselves. While this is boiling, get the onions with some salt going in a pan with olive oil. Cook for about 3 minutes and add broccoli. Season with your spices – I went heaviest on salt and dill, and then the sage and garlic powder, and light on the thyme and pepper. Remember, there are a lot components, so don’t be afraid to season! Cook this for about 5 minutes until the broccoli starts getting soft. Add in mushrooms and cook down a little longer – about two minutes. Then add in tomatoes and spinach leaves. Cook until the spinach leaves start to wilt. Add in feta cheese and stir around to incorporate and get melting. By this time, your pasta should be ready. Drain it, but not entirely, leave about a tablespoon of cooking water. If you use penne rigate, a lot of that cooking water will be inside the pasta anyway. Add in your veggie mixture. I hope you used a large pot because there are a lot of ingredients here! Mix together to further melt the cheese. Serve with your heated sausage sliced up and some crusty buttered French bread. That’s what I told my roomie last night at the store when we were picking up stuff for dinner. The (new) boyfriend [a few things have changed since the last time I posted] decided he wanted to make me dinner. And since his apartment has next to nothing in the way of cooking supplies, I had to (reluctantly!) let him use my kitchen. It wasn’t so bad. Would have been better if he cleaned it up. So this is probably the most simple recipe in the world. Take chicken, we used little tenders, and put them in a single layer in a casserole dish. He claims that using a whole chicken is the best, but I did not want the work of prepping that last night. I had the feeling he probably wouldn’t have known how to. Anyway! So pour enough beer over the chicken to coat it. I bought Coors Light, because of the simple fact that I won’t cook with an alcohol that I won’t drink, and I don’t like the flavor of beer. Except for that one. And a couple others. Then – this is where the “secret family recipe” comes in – aka, he didn’t know exactly how he wanted to flavor it, so he used that excuse to trick me into letting him cook it. I was told to go relax. Weird. So then, put in some garlic powder, salt, pepper, poultry seasoning, red pepper flakes, and rosemary. Just a little of each. Put it in a 375 degree oven for 45 minutes, then pour another bottle of beer over it, and put it in for another 20-30 minutes. Simple. Easy, and semi-quick. We had leftover rice to go with it, and a can of green beans. 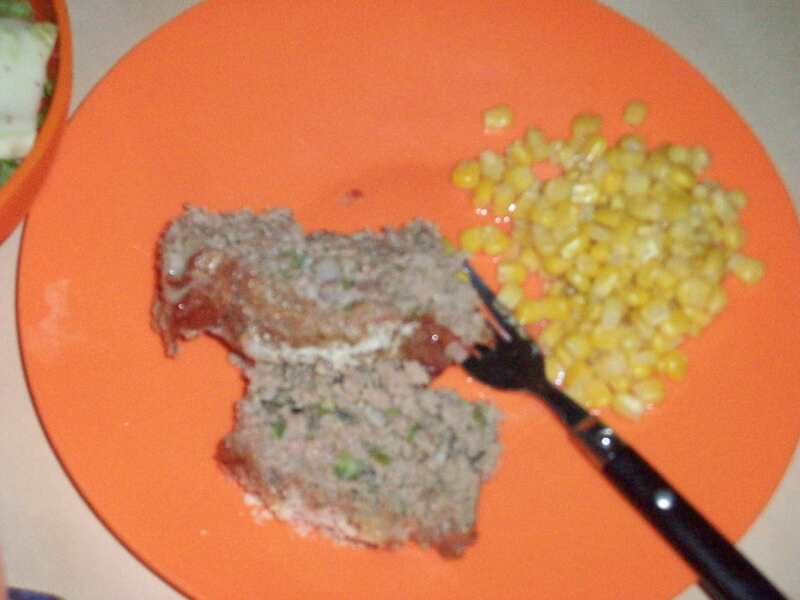 If nothing else, it was a budget meal…and possibly something that would be good on a white trash recipe site! By the way – what the heck is in poultry seasoning that makes it clump?? The much anticipated post about the chili! It’s taken me a while to catch up here, mainly because of spring break traveling. So I decided I wanted chili. The trick was finding a good recipe for chili. Ah hell, who needs a recipe? Make it up as you go! I gathered bits and pieces from friends and family and then did my own experimenting. The whole crock pot thing made it unbelievably easy though. So I fried up some ground turkey and some ground mild Italian sausage. Then I added that to the crock pot. Let me just say now that this recipe is a layering of flavors. Next went in a can of pureed tomatoes, then a can of diced tomatoes, and a can each of drained pinto beans, kidney beans and black beans. Let me thank the dollar store for those. I followed the canned ingredients with a diced jalapeno (seeds removed because I’m a wimp when it comes to too much spice), minced garlic and half a diced onion. Finally, comes a whole slew of spices. I added in a bay leaf, a beef bouillon cube, parsley, paprika, thyme, chili powder, garlic powder, sage, cilantro, oregano, and cayenne. Mix it all together, let it cook on high for about 3 hours, then down to low for another two hours and served it up with cheese and sour cream. I was told Italian sausage doesn’t belong in chili, but I kind of liked it. 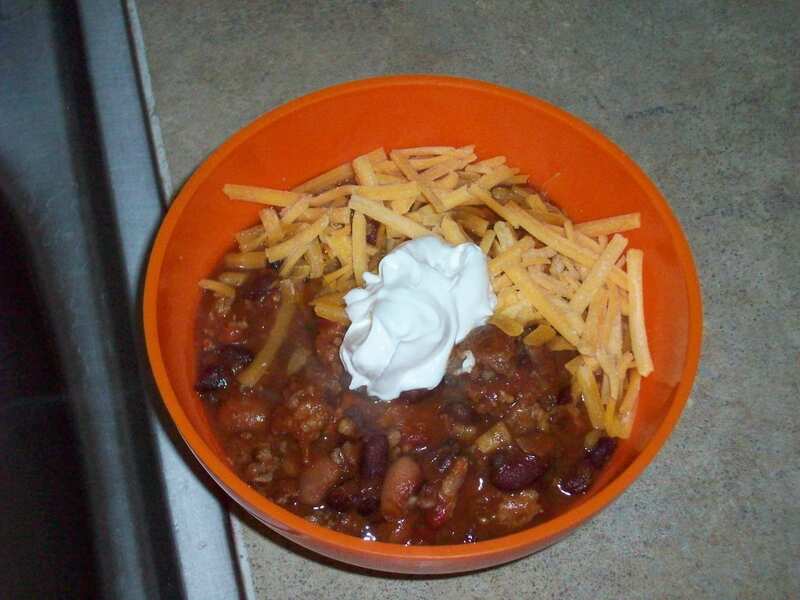 It could use some tweaking, but as the roomie put it, it’s “a good experiment chili.” Here’s the recipe. So I was lazing around the couch two days ago, and of course I had the Food Network on. And I was trying to figure out what exactly I was going to do with those chicken thighs I had just pulled out of the freezer. Well, Quick Fix Meals with Robin Miller came on, and she was talking about using a slow cooker for her show. Then she added celery (got that…), green bell peppers (got those…), onion (definitely got that…), chicken (yep), and whole slew of spices to the crockpot. She said she was making Chicken Gumbo. Gumbo. Hmm…I wonder what that tastes like? Until last night, I’d never had gumbo. So the only ingredients that I was missing were the andouille sausage, so I used smoke turkey sausage. And then I had to go get the chicken broth and tomato juice. So all in all, I spent like 3 bucks on this meal because everything was something I already had. How awesome is that?? 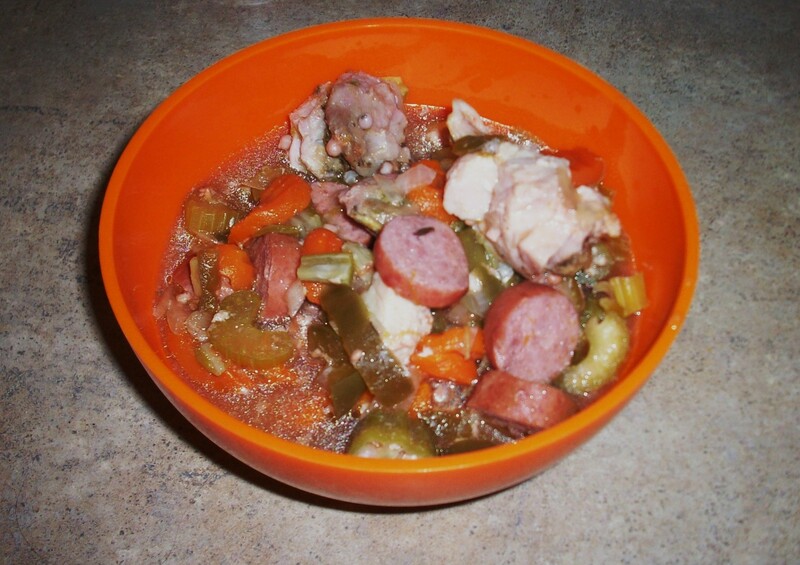 This is the gumbo after it's cooked for six hours and is ready to eat. The only other snag I ran into was I wasn’t entirely sure if my crock pot worked or not. For some reason, mine doesn’t have a light to tell me if it’s on or not? So after I had left for work, I asked my roomate to tell me if it was warm. It was. Probably a good thing because I don’t think it would have been as good if I was only letting it simmer in a pot for two hours after I got home. What was really nice is that I prepped all the ingredients the night before, put them in a bag and put them in the fridge, then just dumped the bag and the juices in the pot with the liquids, stirred it up and turned it on. After 6 hours it was ready to go. I think I have some ideas for variations now that I know what the good stuff tastes like, but those are in the future. Credit to Robin on my bibliography page. So all I had was steak. The question was what to do with the steak. Then I noticed I had some leftover home-made guacamole from the Super Bowl. And cheese. And only two tortillas. Logical conclusion just screams fajitas. Now how to spice my fajitas? Worcestershire, lemon juice, lime juice, Tabasco, spicy mustard, steak sauce, garlic powder, onion powder, chili powder, paprika, dried cilantro. A little of this, a little of that, all to taste. I chopped up the steaks, threw them in the pan with all those prior ingredients and let them simmer, turning them every so often. They shrank and turned brown. I heated up the tortillas on the gas stove, just threw them on the flame and kept moving them and flipping them. No pan needed. Add cheese to the bottom of the tortilla, then meat, then lettuce and the guacamole. I would have posted a picture, but it didn’t look as appetizing all opened up. I’m sure that everyone knows what a rolled up tortilla looks like anyway.